For more information, contact Maria Musaitef at (818) 257-3161 or maria@rockallnight.com. The Lex and Terry Morning Show offers an original blend of male-oriented content with a focus on lifestyle, relationships and edgy humor. "Disturbing the Comfortable...Comforting the Disturbed." 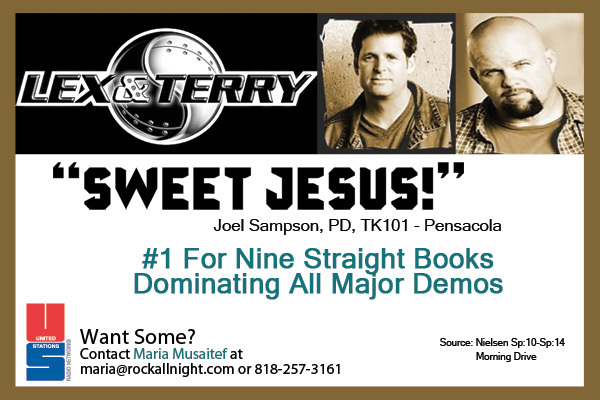 Since 1997, The Lex & Terry Morning Show has been spreading like wildfire on some of the highest-rated radio stations across the country. United Stations is proud to offer their original blend of male-oriented content with a focus on lifestyle, relationships and edgy humor. L & T bridge the gap between talk show and shock jock, creating an intoxicating lifestyle program that appeals to men in all demos. Here's your chance to get with the program!